“So how far are you planning to walk today?” was a question often heard on the Camino. In the early days of my walk to Santiago, I knew the answer. I had an Excel spreadsheet that listed all the towns in which I planned to stop and the distances between them — in both miles and kilometers. I printed it on purple paper before I left home so I could easily find it, usually stuffed in the middle of my guidebook. “It’s just a rough idea,” I told fellow pilgrims who saw it. Should you open the door to my walk-in closet right now, you will find twenty-three items of clothing and four pairs of shoes. That’s it. I have been participating in Project 333 since October 14, 2012. That’s the day I went through my entire wardrobe and picked thirty-three items I would wear for the next three months. For me, that thirty-three included clothes, shoes, coats, and jewelry. The process of choosing wasn’t as hard as I thought it would be. I started with the jewelry. I opted for one pair of earrings, my favorite necklace, and a watch. 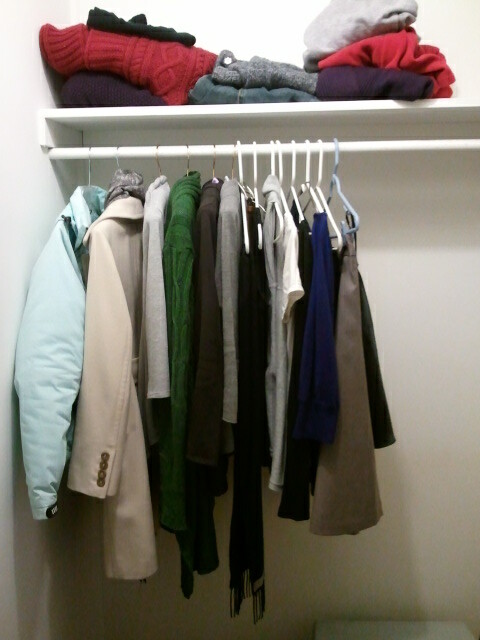 I chose six pairs of shoes, three coats, and the rest comprised jeans, sweaters, shirts, pants, one dress and one skirt. 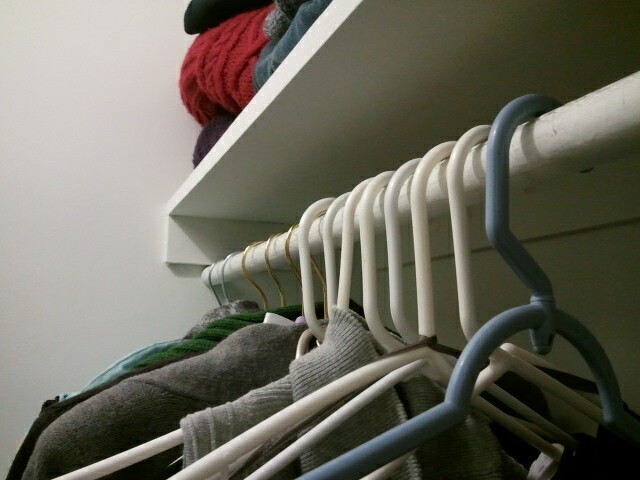 I took everything else and put it in a smaller closet in the eaves. Now, the rules are not set in stone. I did break out a sparkly dress for New Year’s Eve, and traded out a pair of winter shoes for summer shoes when the weather got unseasonably warm late in October. But for the most part, I’ve stuck to thirty three. Now that my three months are up, I get to do it all over again. I get to put everything back together and pick thirty-three for the next three months. Opening my closet door in the morning makes me smile. It’s not crammed with stuff. I don’t have to search for anything. There’s space in there! I always have something to wear. Ironic since I’ve so severely limited my choices. I spend much less time trying on outfits before going anywhere. I only have a few options – and I know which ones look best for which occasions, and so I just go with those. Something about fewer options has given me such a sense of relief. I have two paper bags filled with clothes to be given away. Some are things I initially deemed as worthy enough for my original thirty-three, only to realize I don’t really like them anymore. Others are from that closet in the eaves — I realized I’ve lived through days ranging from 35-70 degrees and haven’t missed much, so it’s easier to let things go.